From the Island Impressions series photographed on Amelia Island. ©Lee Anne White. During this Thanksgiving season, I am, as always, deeply grateful for a loving family, dear friends and our many freedoms. I am also thankful for art. About eight weeks ago, we decided to sell the house we have lived in for 17 years. When we learned a house we loved would soon be coming on the market, we saw this as a good opportunity to downsize and be closer to family and friends. Getting through some renovations, repairs, negotiations, clearing out with a smaller house in mind, and packing in such short order has been a challenge. But If all goes according to plan, we move in three weeks. So what does this have to do with art? Well, the drawings, prints, paintings and photographs are coming off the walls. The pottery, wooden bowls and handcrafted baskets are being cleared from shelves and tabletops. The books we love are quickly filling boxes. I cherish each and every piece that gets wrapped and packed away. I am reminded of the individuals who made them and the moments when we discovered or received them. I pause to appreciate their beauty or to remember the stories shared between their covers. I am keenly aware of how bare and lifeless our home looks without their presence, and appreciate how much they contribute to making a house a home. I am excited about the move—about living closer to family, friends and my studio; about creating a new home and establishing new routines; about taking these pieces of art out of boxes and finding the perfect spot for them in a new place. So this Thanksgiving, in addition to being thankful for family, friends and freedoms, I am thankful for all of the artists who share their talents and express themselves in creative ways, and whose work enhances our home. And as an artist, I am thankful for those who support me in my artistic endeavors—whether through a kind and encouraging word, by purchasing work to enjoy in your home, by participating in my workshops, or by sharing my work with others. Becoming an artist (like anything else) is a journey. There is the creative journey—exploring the possibilities, mastering the craft, finding your voice and vision, and making unique work. Then there is sharing this work—seeing it off into the world to complete the creative process—all while exploring ways to make ends meet. One of the things that I find curious about this process is that while both creating and purchasing art are very personal activities, the art world tends to revolve around large social events. Art festivals, gallery openings and art auctions are prime examples. Throughout this fall’s events, I have been keenly aware that, even when surrounded by hundreds of art enthusiasts, this is still a process of connecting one person at a time. And so today I say, "thank you." Thank you for being there, for caring and sharing, and for all of the ways in which you support, encourage, challenge and inspire me. You are the best! I just wrapped up a year of art festivals—five altogether, with the two largest ones back-to-back these past two weeks. Three of the five were out of state; two were close to home. Some were small, local art and crafts fairs. Some were major festivals with art, music, food and other events. Some were just for contemporary art. 1. Art festivals are hard work. And by that, I mean physical labor. Consider moving your entire "gallery" (heavy tents, display units, furniture and artwork) four times in a weekend (to the car, to the site, back to the car and back to the house). There is also the preparation—making enough work to fill your booth. (This was my favorite part of the process, and I loved having the festival as a motivating deadline.) And, of course, there is manning your booth all weekend. Most events are two days, but some run three. This past Saturday, booths were open from 9am-7pm. That's a long day on your feet interacting with others. Some people find that energizing. Others find themselves drained by mid-day. Either way, what if you could build an art business mostly around creating art and traveling to interesting places to show and sell your work? There are many who do just that! 2. Art festivals are highly susceptible to the whims of Mother Nature. I've always thought of festivals as having ideal weather. I now realize that's just because it's the only time I ever go to them. As it turns out, the events go on, rain of shine. But people don’t buy art when it is raining, snowing, freezing or 98 degrees outside. The weather can also take its toll on your booth or inventory. Eight booths were destroyed in heavy downpours at one of the events I attended. Heavy winds blew framed art off my walls at another. I heard stories of hurricanes, tornadoes and flooding along the way from other artists who have been doing this for a while. Still, they persist. 3. How to talk about my work. When you talk to a steady stream of people all weekend, you start to get the hang of talking about your work. That was something I really needed to do. I now have a better sense of what stories to share, what to leave to the viewers' imagination, when to engage and when to step back and just allow viewers to enjoy the work. The best part of every festival was connecting with individuals drawn to my work, whether they purchased it or not. In fact, one of my favorite conversations last weekend was with a teenager who was genuinely curious, remarkably articulate and truly passionate about landscape photography. 4. Every day is different. Some days people buy. Some days they don’t. Saturday and Sunday crowds tend to be different. And it’s really hard to know why or what to expect. The most consistent predictor I found was the weather. In beautiful spring or fall weather, people love to get outside and are generally in a good (and hopefully "buying") mood. 5. Locally organized festivals tend to take better care of artists and promote events better. They have more at stake, the support of the community, volunteers on site, the attention of local media and are often doing these as fundraisers for some local cause. Certainly, there are exceptions, and that doesn't mean shows by promoters cannot be great shows. But I did notice a significant difference in the shows I attended. 6. In addition to needing inventory in all price ranges, it really helps to have a signature “gift” item for $20-25. Even at slow shows, the artists who had this still had sales to cover their out-of-pocket expenses. I haven’t figured out what mine is yet. 7. Every sale you make takes effort. Art is not a commodity. It is a very personal purchase. When others buy art, the connection they make with the artist is usually an important part of that process. In turn, I genuinely loved connecting with buyers--hearing what attracted or spoke to them, how they planned to use the artwork, and even a bit about their personal lives. I love knowing my work has found a good home. 8. Not everyone is going to like your art. In fact, most people will never even cast a glance your way. And that’s okay. We all have different preferences for food, music, clothes and, yes, art. I'm learning not to take it personally. 9. Inventory portability, durability and weight are all issues to consider. You have to load and unload your artwork every time you go to a show; it can take a beating in your car if you don’t pack them well; and customers have to carry pieces home once they are purchased. I switched from glass to acrylic midway through the season; now I'm exploring options to eliminate framing altogether. 10. Each venue is different. I'm not sure I realized just how different each show is until this year. If you’re going to participate in festivals, you have to figure out where your audience is and go there. Is it big cities or small, rural communities? Is it an arts-and-crafts fair or contemporary art show? Indoors or outdoors? Mountains, coast or plains? I had several good shows and a couple of truly forgettable ones. I believe I have a better sense for which types of shows work for me and which don’t. If I continue participating in art festivals, I have some changes I’d like to make in my inventory and the way I present my work. For now, however, I just want to rest and spend some time in the studio creating new work. I also have other markets I’m anxious to explore—in some cases, based on feedback I received at the festivals. Whether I continue participating in festivals or not, they were good learning experiences and I loved being able to share my work with others in a casual, outdoor environment. isans I met at these festivals were kind, generous and hardworking. They’d lend a hand in a heartbeat and were generous with tips and advice. We’d keep an eye on each other’s booth for bathroom breaks, and keep each other company when the weather turned bad and festival goers went home. Some of these folks make their living doing two shows a month; others were more like me, just trying to figure it out. I tip my hat to all of them and wish them much success in their artistic and marketing endeavors. Why Does Art Matter to You? The Bainbridge Island Museum of Art has initiated an online interactive program that encourages people to post why art matters to them. This (above) was my response. What would yours be? Feel free to respond here or post on the project site (or both!). It had been a long, bitterly cold day. I had been slogging through snow and ice against biting winds since shortly after sunrise. During the first few hours of shooting, the temperatures did not rise above the low teens. They did not break freezing all day. I welcomed the sunset and the opportunity to head back to the hotel for a hot shower and satisfying meal. 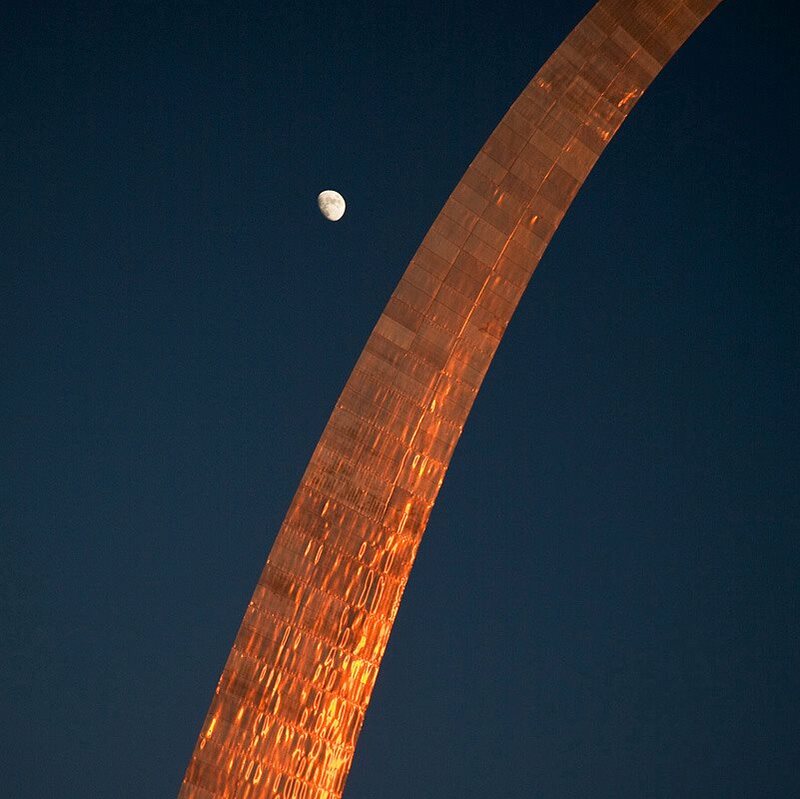 I was just a block away, eager to dart indoors, when I happened to look up for one last glance of the St. Louis Arch. And this is what I saw--both the moon rising and the sun setting. It was stunning, and I had only a few moments to dig my camera out of the bag for this hand-held grab shot.